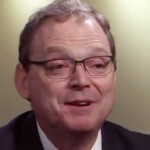 Federal workers who are without pay as the government shutdown drags on actually have it pretty good, according to Kevin Hassett, the chairman of the White House Council of Economic Advisers. He told PBS’ “NewsHour” Thursday that a lot of federal employees were already planning to take time off between Christmas and the New Year — and so the government shutdown essentially gives them a vacation for free. After meeting with President Trump Friday, Sen. Lindsey Graham (R-SC) once again called on the President to declare a national emergency and build a border wall. “Morning Joe” host Joe Scarborough smelled something fishy in the National Enquirer’s expose on Amazon CEO Jeff Bezos’ personal life and alleged infidelities. “I hope it works,” he added. 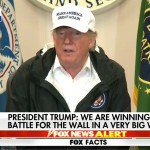 Trump At The Border: The Word 'Manufactured' Is Manufactured! President Donald Trump isn’t a fan of Democrats’ line about the situation at the border. Democrats have called Trump’s fervor for a border wall and ramped-up rhetoric about illegal immigration a “manufactured crisis.” During a trip to the border on Thursday, Trump said the word “manufactured” is … manufactured. 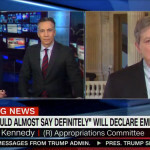 Sen. John Kennedy (R-LA) said Thursday that if House Speaker Nancy Pelosi (D-CA) put her personal feelings toward President Trump aside, it’d be a lot easier to strike a deal to end the weeks-long government shutdown. 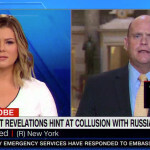 That was Rep. Tom Reed’s (R-NY) reaction when asked about the revelation that former Trump campaign chairman Paul Manafort shared internal campaign data with a Russian associate — reportedly with instructions to pass it along to pro-Russia Ukrainian oligarchs Manafort had worked with. The New York Times initially reported that Manafort wanted the data sent to Russian oligarch Oleg Deripaska, but issued a correction to that reporting. Manafort instructed the information be sent to Serhiy Lyovochkin and Rinat Akhmetov, both of whom Manafort had worked with. It’s still on the table. 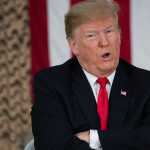 After reports over the past couple of days indicated President Trump was waffling over whether to declare a national emergency in order to get his favored border wall, the President on Wednesday said he has an “absolute right” to do so. The war between CNN and the White House is back on. CNN White House correspondent Jim Acosta and White House counselor Kellyanne Conway got into it Tuesday outside the White House. 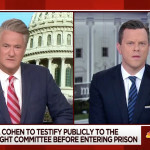 It apparently started when Acosta asked Conway if President Trump plans to be truthful during his prime time Oval Office address on border security Tuesday evening, Roll Call reported.